Pneumatic and battery-operated nail guns and brad nailers drive fasteners with considerable force. On occasion, a nail gets caught in the gun or hits an object and deflects, causing a jam in the gun. You'll recognize that a jam has occurred when you press the trigger of the tool and it refuses to fire. Most nail gun owners experiences this from time to time, and if you use these tools frequently, it's important to know how to unjam the gun quickly and efficiently. There is potential for physical injury to the user or damage to the tool, so make sure you understand the proper procedure for removing a jammed nail — knowing how to do this will get you back to work quickly and safely. 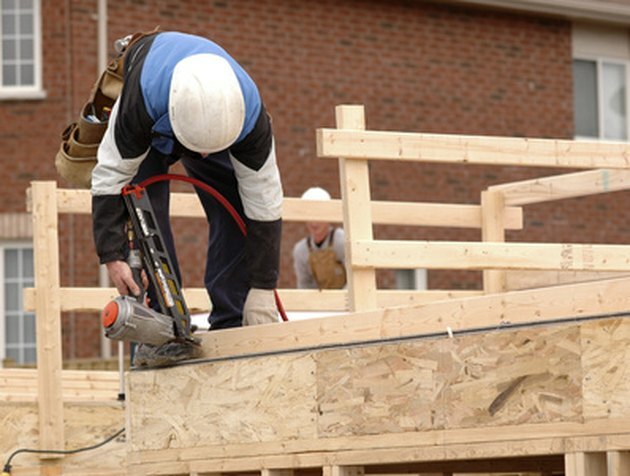 Framing nailers can greatly speed carpentry work, but they occasionally jam and require service. Procedures may differ slightly, depending on the tool manufacturer, so you should have the use-and-care manual handy when doing any kind of troubleshooting or maintenance on a power nailer. But the following procedure will work for most tools. Whether your nailer is a pneumatic model that operates with compressed air, or an electric or battery-powered nailer, always disconnect the tool from its power source before beginning. This means disconnecting the air hose, unplugging the power cord or removing the battery. Look for a release lever on the nail gun. If your nail gun is so equipped, this will allow you to release the jammed nail, ending your repair effort right there. Not every model has a lever, though, so if there is no lever, open the magazine on the nailer. Most guns have a flip-style mechanism on the nose that allows the magazine to slide open. If this is stuck, use a claw hammer or pair of pliers to gently pry it open, then slide the magazine open. Identify the jammed nail — it should be obvious due to its off-kilter position. Use the tip of a nail, a pair of pliers or the claw portion of a hammer to dislodge the jammed nail. This is a process that can take quite some time, so be diligent and keep at it until you've dislodged the jam. After prying out the jammed nail, also remove all other nails in the magazine, even if they appear to be correctly loaded. Inspect the nose of the gun for any damage — if there is visible damage to the gun itself, it may need professional servicing. Refill the gun with fresh nails, and close and lock the nose. Restore the power source (reattach the air hose, plug in the power cord or reinsert the battery). Test the gun's operation on scrap lumber to make sure it is now operating correctly.